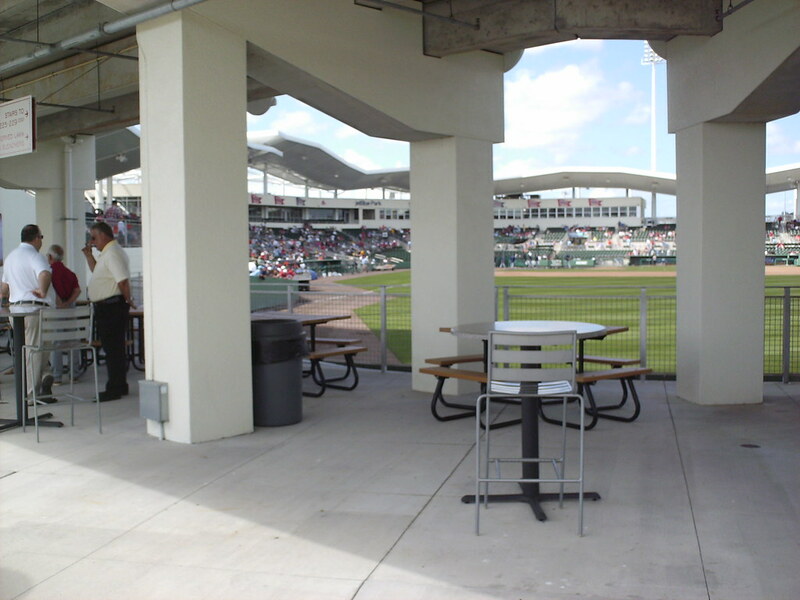 The view from behind home plate at JetBlue Park. 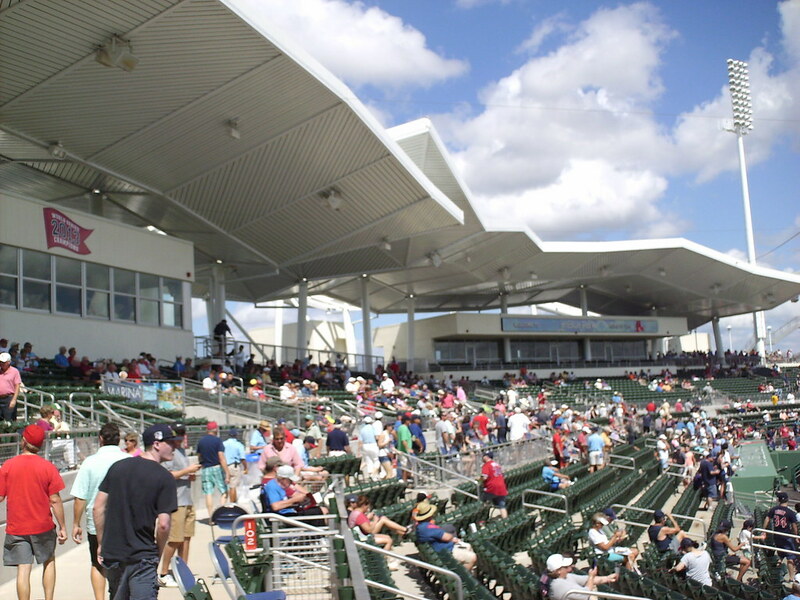 The grandstand at JetBlue Park, as seen from the right field corner. 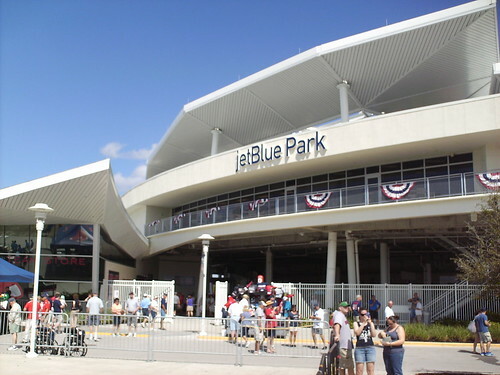 Like at Fenway Park in Boston, the pressbox facade features banners celebrating the Red Sox American League and World Series championships. 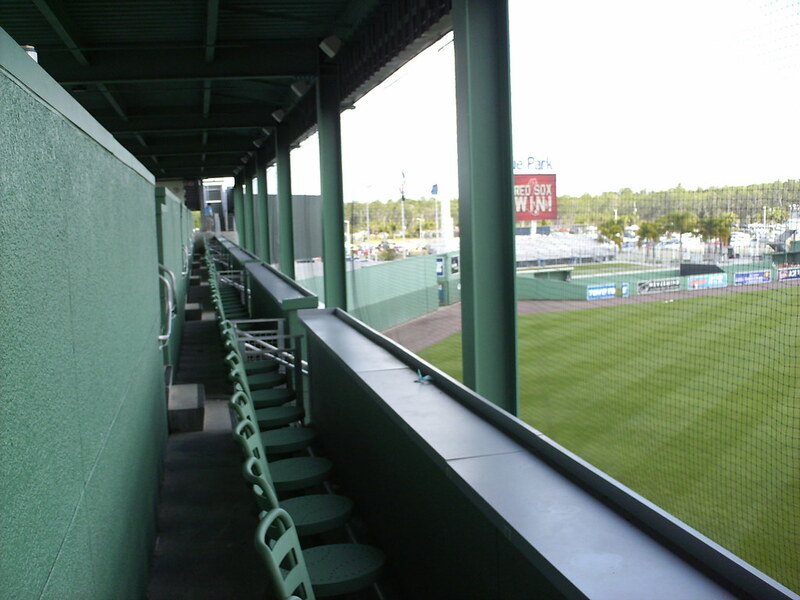 Luxury suites sit in a separate building down the left field line. 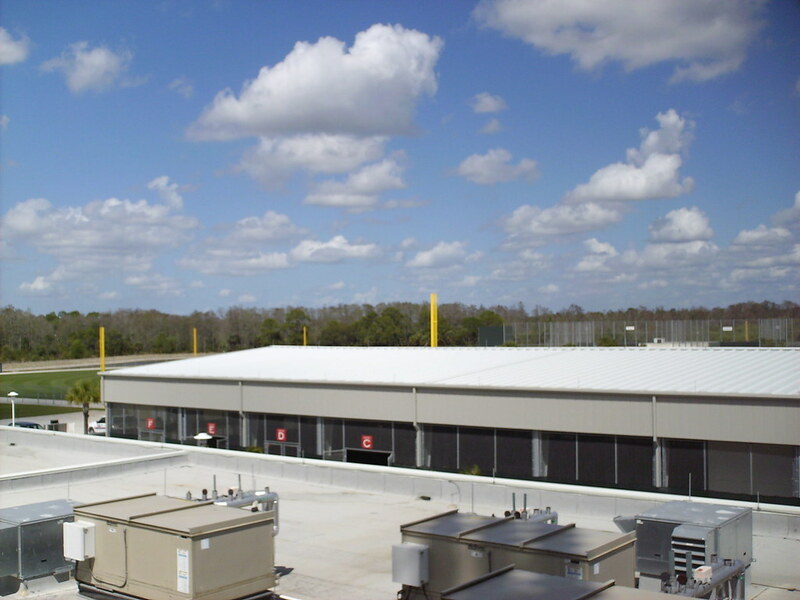 The overlapping corrugated roof panels are supposed to represent the waving cypress groves found in the Fort Myers area. 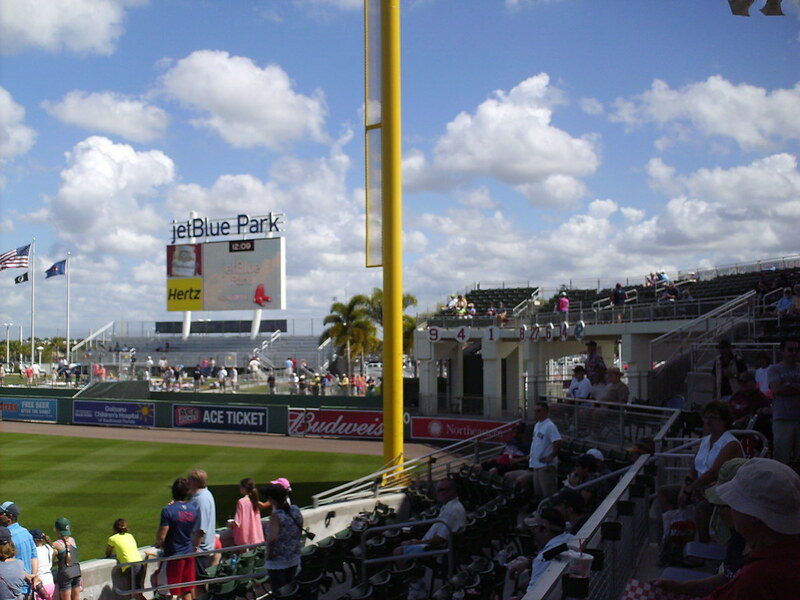 Bleachers and berm seating by the flag poles in center field. 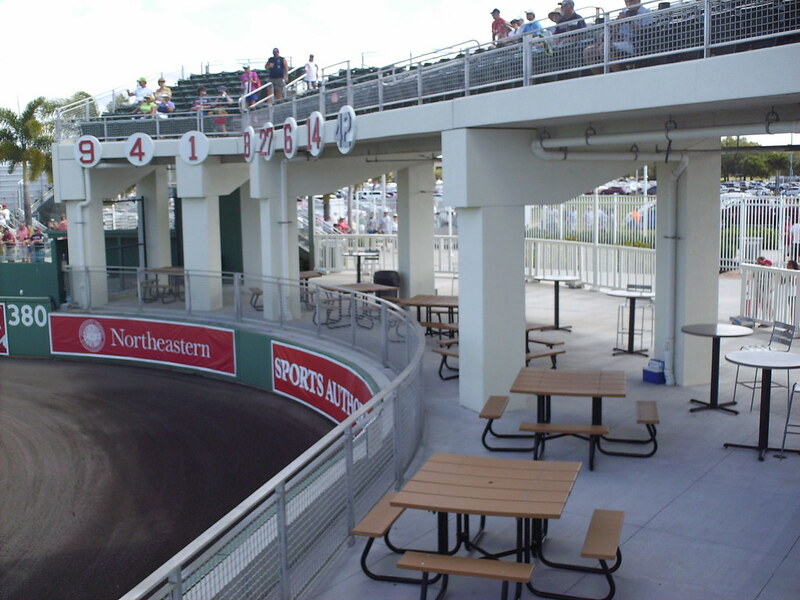 Picnic table seating wraps around the right field corner on the main concourse, while Red Sox retired numbers hang on the front of the second deck seats. 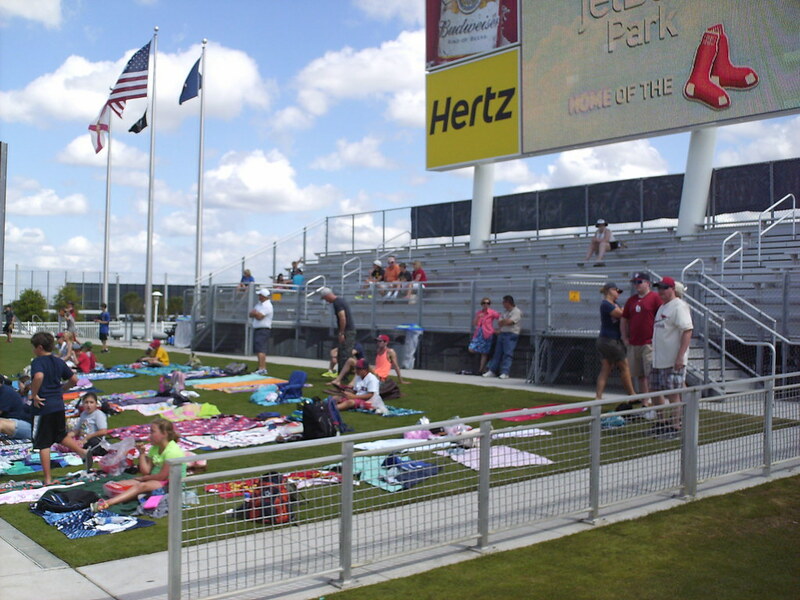 Group seating areas along the outfield concourse look out onto the field of play. 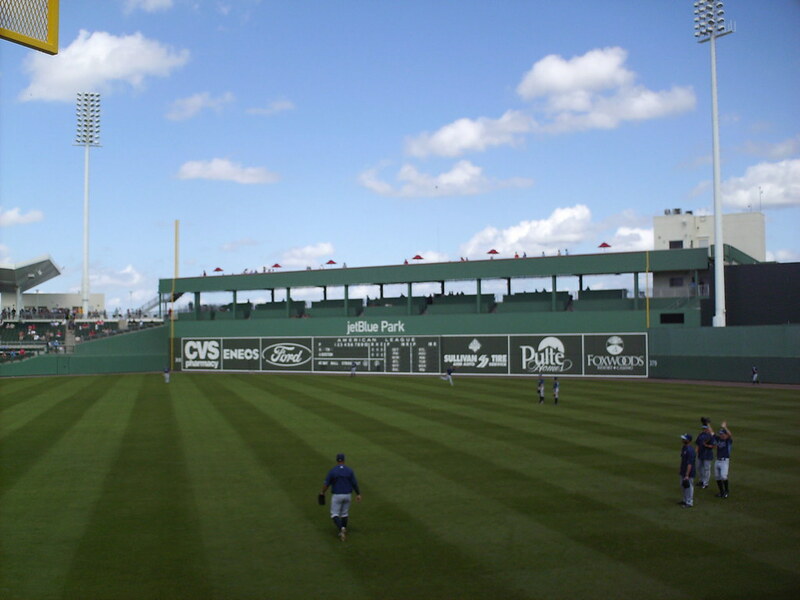 Just like at Fenway Park, the grandstand in left field wraps all the way around to hug the third base line, running right up against the Green Monster. 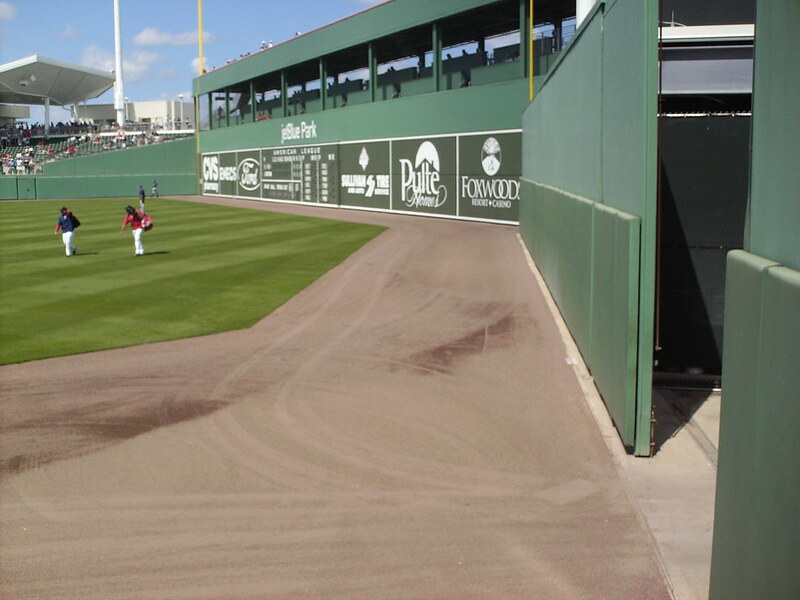 The Green Monster at Fenway South is actually a few feet taller than the one in Boston, as fans can no only sit atop the wall but inside of it. 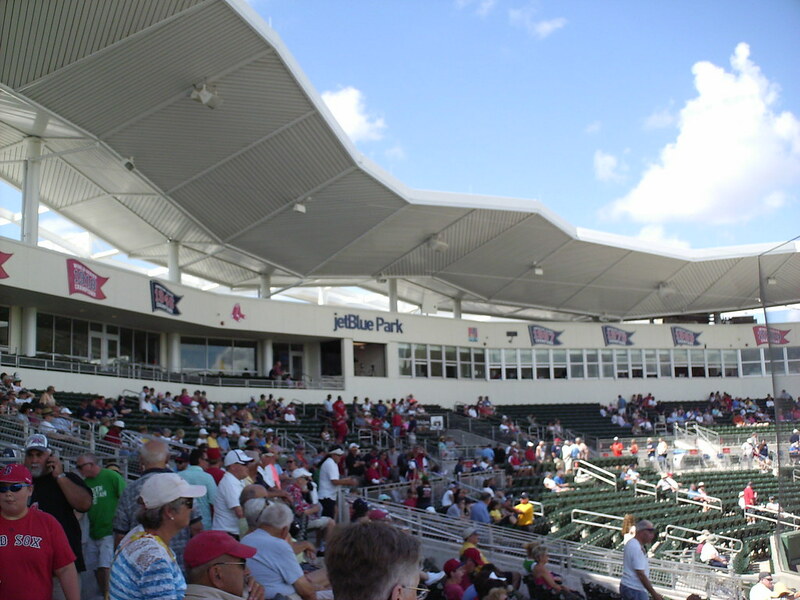 Several rows of seating with drink rails look out from inside the tall left field wall. 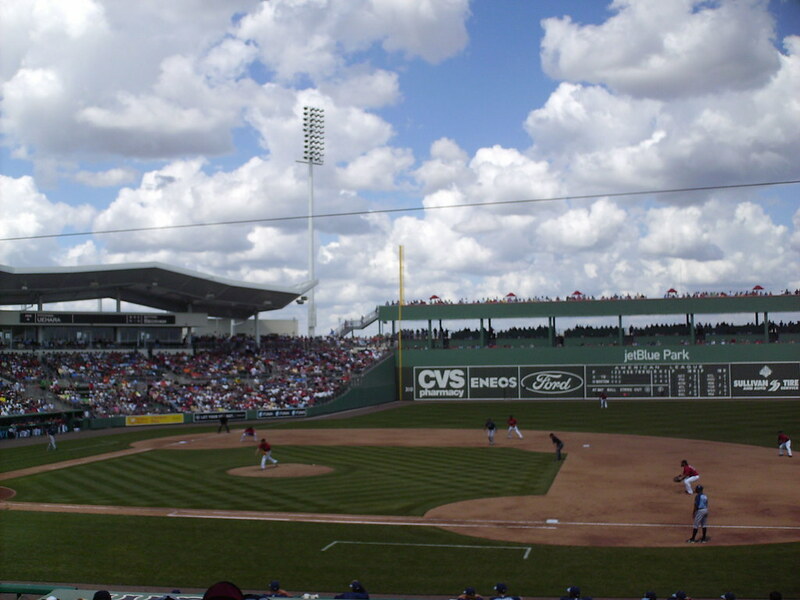 The view from inside the Green Monster. 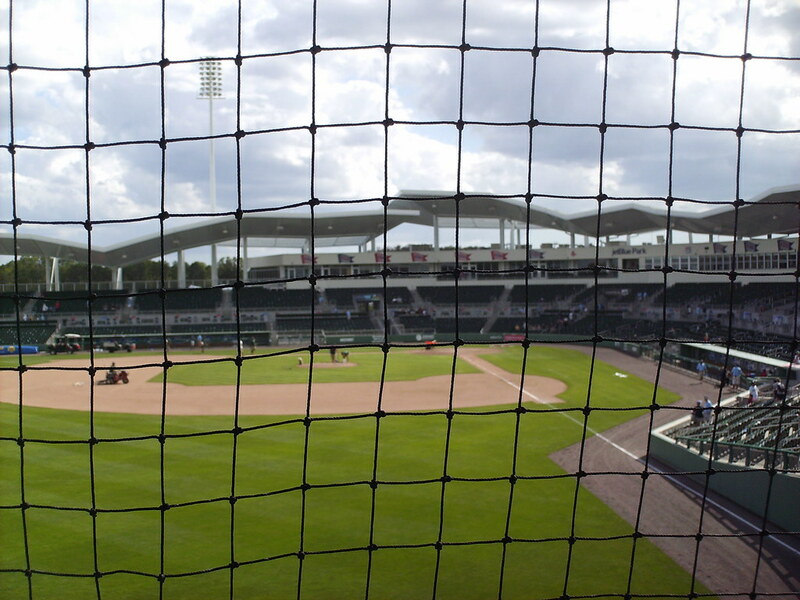 Netting stretches across the windows, letting balls bounce off and back into play. 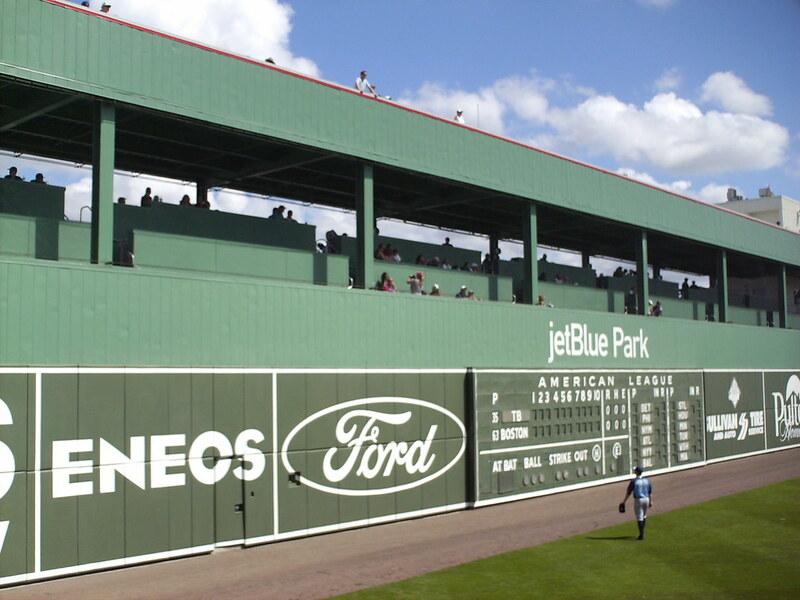 Logos along the outer wall of the stadium celebrate the Red Sox World Series wins. 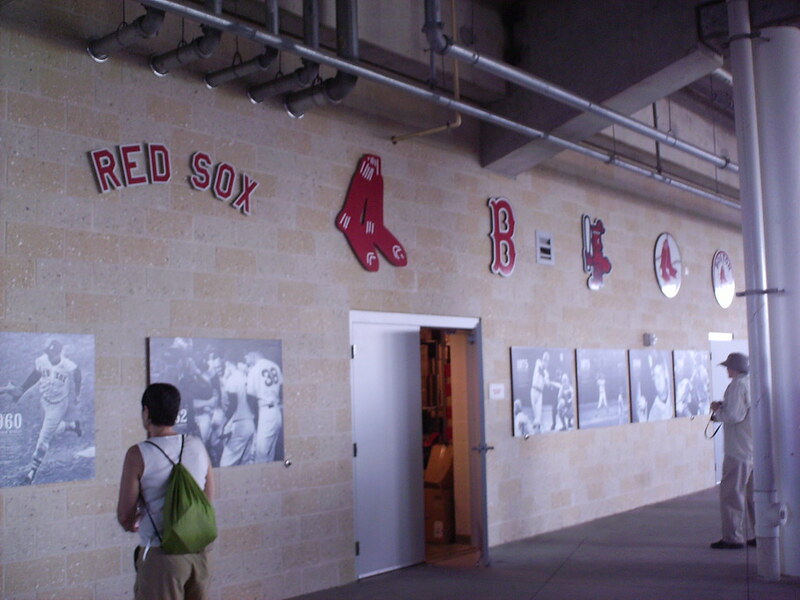 The lower concourse features photos of important moments in Red Sox history and a timeline of team logos. 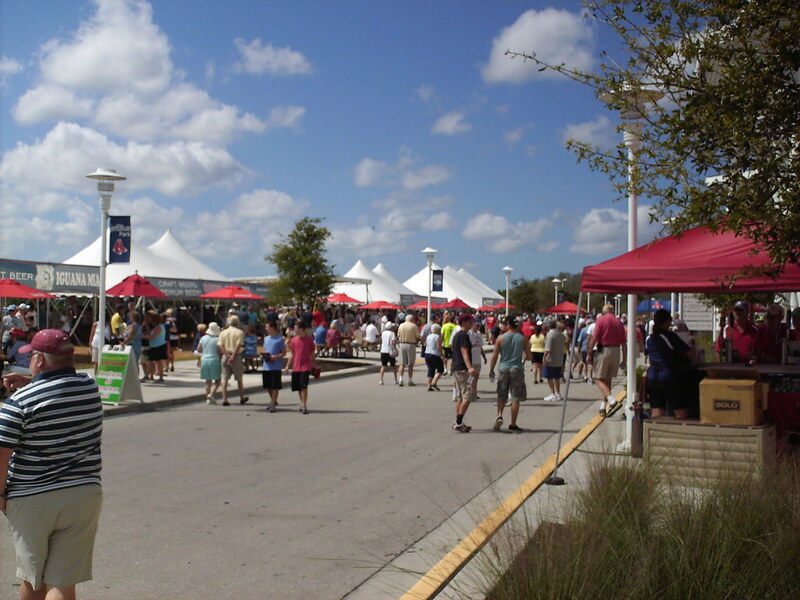 Much like the Red Sox close off Yawkey Way during game days, making it part of the park, the road in front of JetBlue Park is closed off and concession tents and stages for musical acts are added to form an outside concourse. 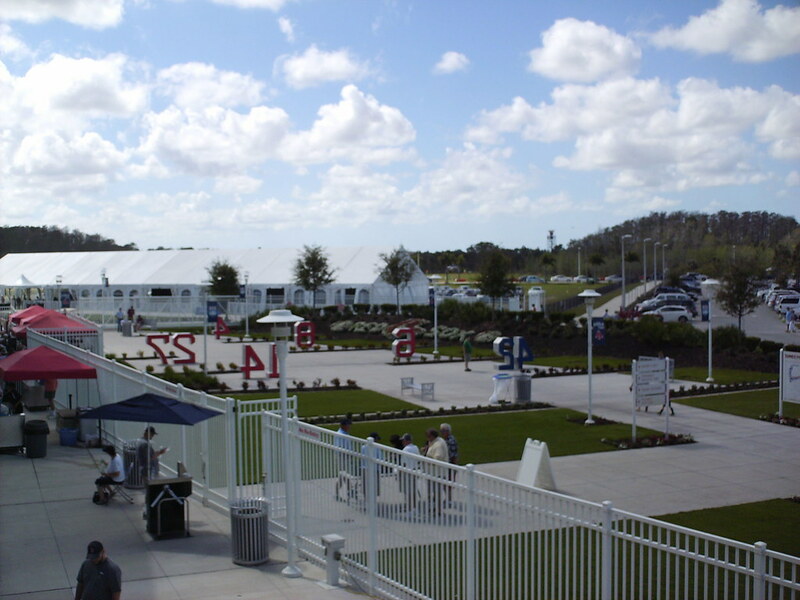 An entry plaza outside the park features statues of Red Sox retired numbers. 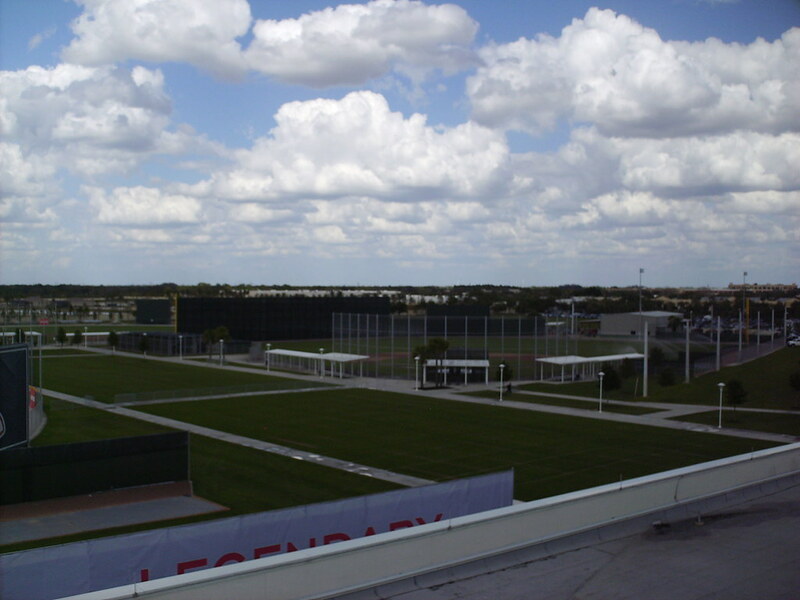 Batting cages and practice fields behind the park, as seen from atop the Green Monster. 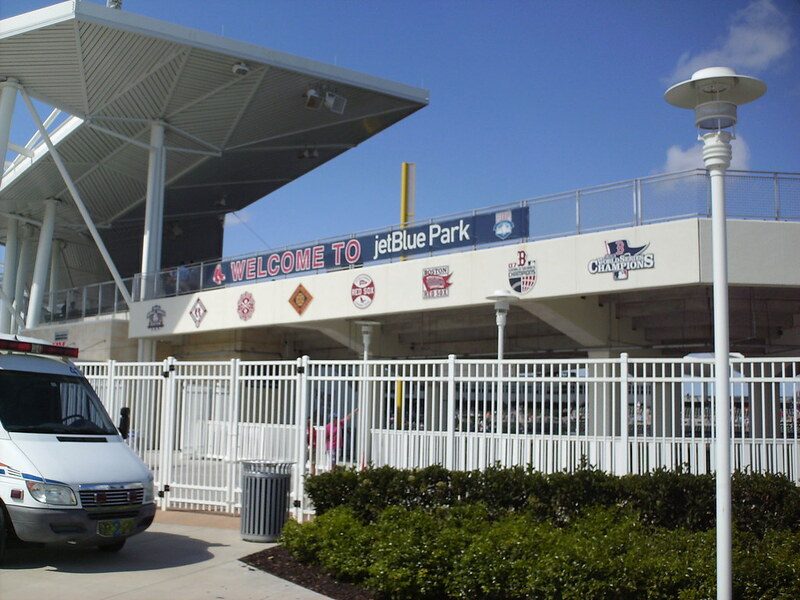 One of the practice fields, where Gulf Coast League games are held, features a chain link "Monster" in left field as well. 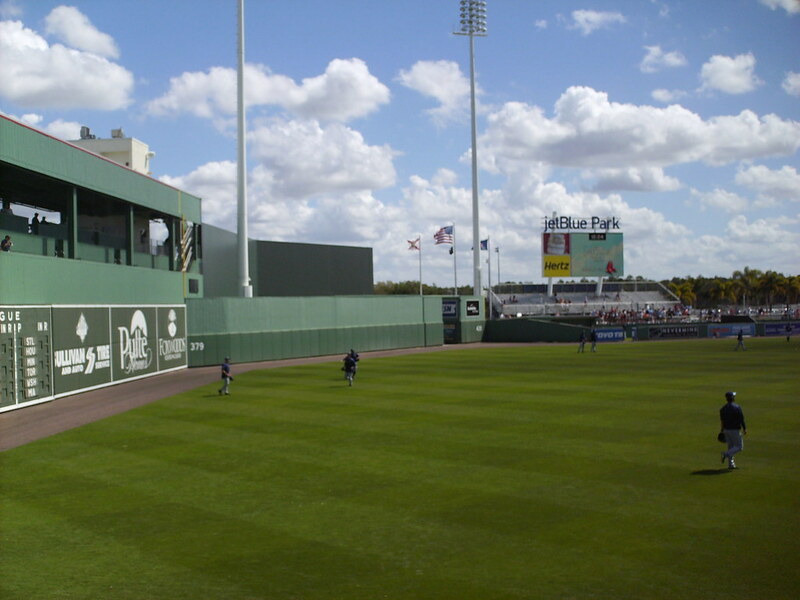 The outfield wall at JetBlue Park. 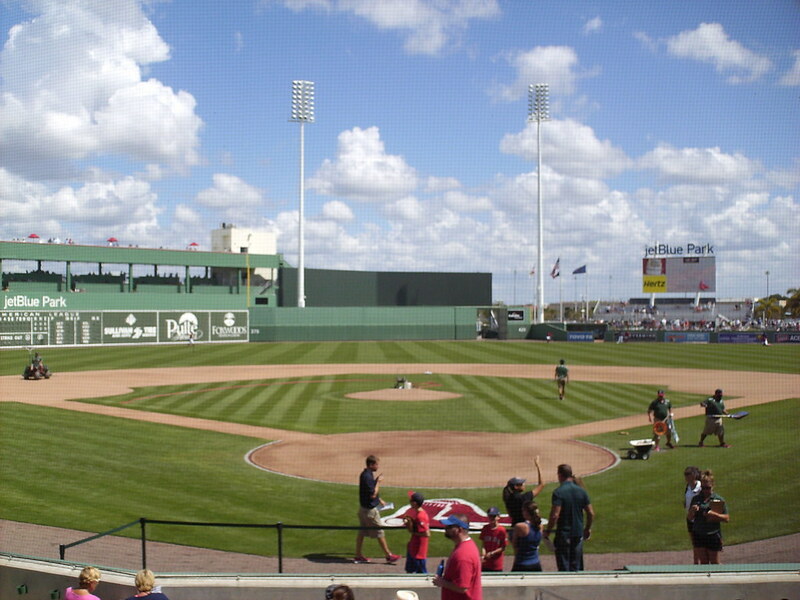 The field dimensions are the same as at Fenway Park, including the Triangle in right center field where the wall stands 420 feet from the plate. 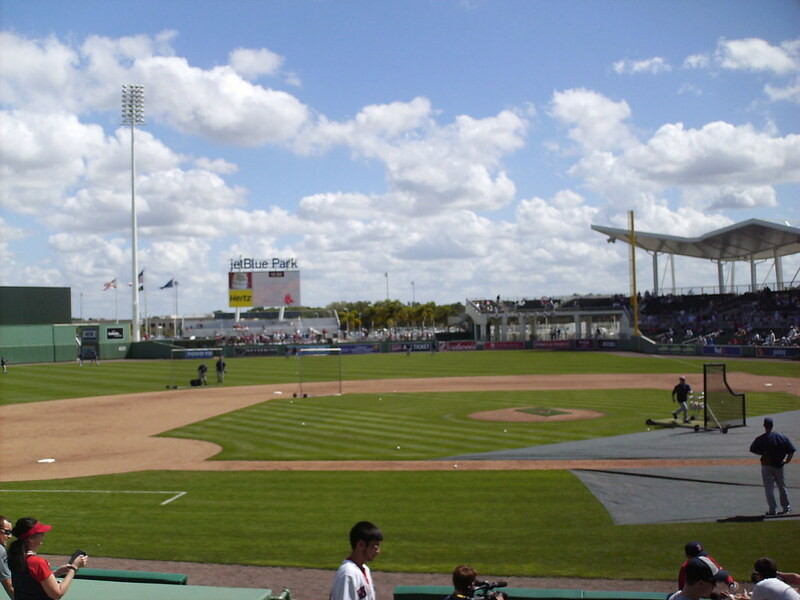 The view of the outfield corners and walls from the Triangle in center field. 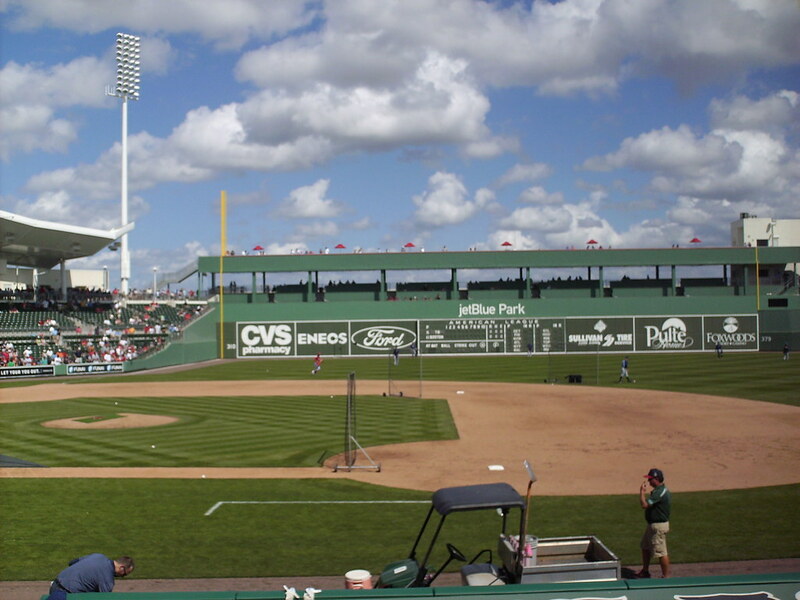 The Fenway dimensions include a Florida version of "Pesky's Pole" and the "Williamsburg" bullpens in right field. The videoboard overlooks the field from behind the bleachers. 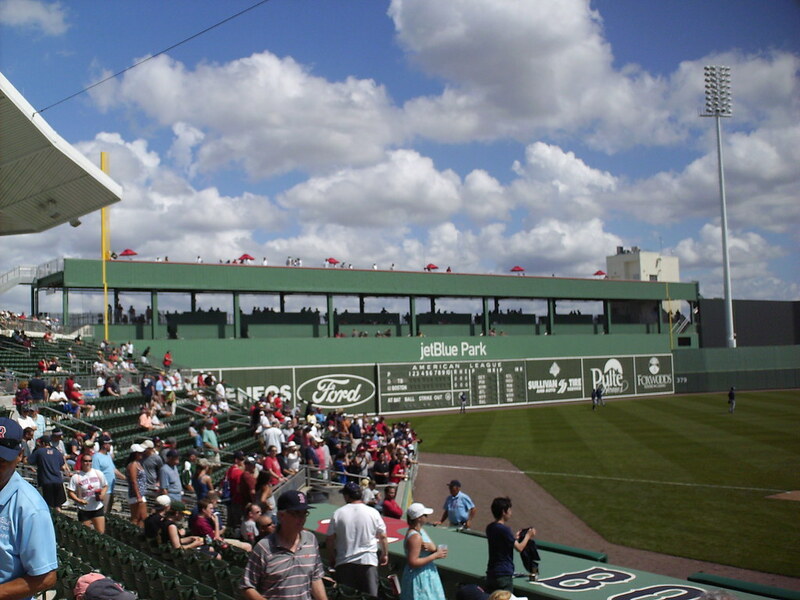 The manual scoreboard on the Green Monster is one that formerly sat on the wall in Boston, though the Fenway South version is mostly changed from the front, on the field. 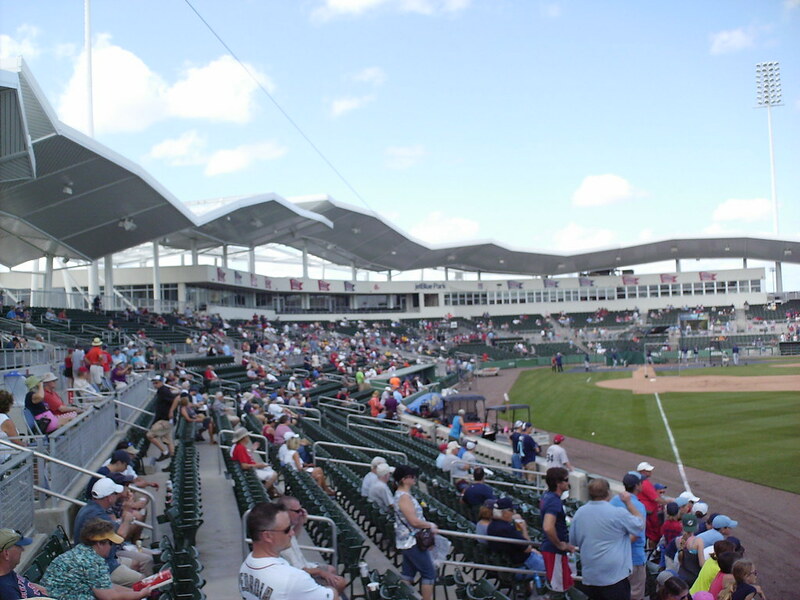 The Boston Red Sox on the field during a Grapefruit League Spring Training game at JetBlue Park.